The release of a new private alpha of Sumerian Blood. Sumerian Blood is now released as a private alpha. Eventually the game is going to cost money, but at this critical stage of forming the gameplay, it will be released as a free alpha. When the time will come to sell the game, I will probably stop releasing free alphas. "Sumerian Blood: Gilgamesh Against the Gods" is a 1vs1 game, in which two opposing armies fight each other. The game is split between a strategy board and an action arena. The two complement each other. In the strategy board you are moving your units, one unit each turn. When the units step on the same cell, a battle arena screen opens and the units fight each other to the death. Depending on the cell the battle occurs on, the units gets an HP bonus. The left army gets a bonus for light cells and the right army gets a bonus for dark cells. To win, you can either wipe out the enemy army or control all 5 power points. In the future there will be other\different winning conditions. The game support both local and online multiplayer, no single player for now. Sumerians are the people used to live in ancient Mesopotamia(nowadays modern Iraq), around 4000BC. Mesopotamia was called "The cradle of civilization" since so many development in history were seen for the first time in Mesopotamia. From the first cities, to inventing a writing language, to agriculture and other things. The game units and setting is based on mythology and history of Mesopotamia. The story is that Gilgamesh(A Sumerian king) has angered the gods, and specifically the creator god An, and thus a battle between Gilgamesh(followed by his people) and the gods is set in motion. Currently there is only Gilgamesh's army in the game, and even then it is not yet complete. So this is Archon with a new tileset or? 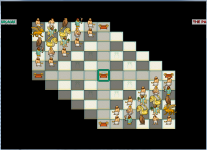 It's inspired by Archon, but it has different units, different abilities, different strategy goals, different terrains.